Plane carried 149 passengers from 33 countries - including 2 Israelis - and 8 crew members. All were killed. 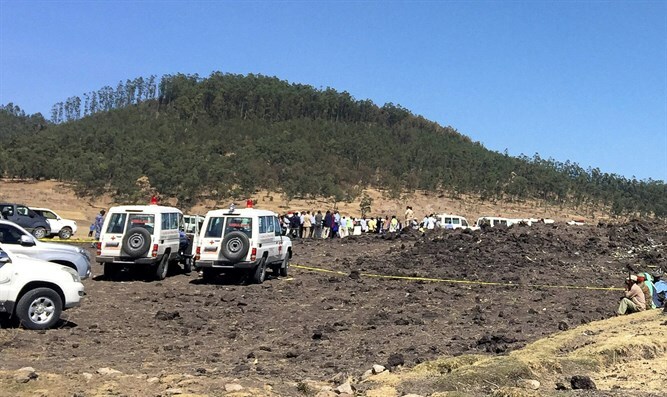 Ethiopian Airlines officially confirmed on Sunday that among the 149 passengers of the company's flight who died in the plane crash this morning were two Israeli citizens. There were 149 passengers from 33 different countries and 8 crew members on the Boeing 737 flight, all of whom died in the crash. A preliminary examination of the events revealed that before the crash the pilot reported to the control tower and asked permission to come back and land in the airport, but the plane crashed before he could do so. CEO of Ethiopian Airlines Tewolde Gebremariam said at a press conference that among those killed, 32 were Kenyans, 18 Canadians, nine Ethiopians, eight Italians, eight Chinese citizens, eight Americans, seven British citizens, seven French citizens, six Egyptians, five Dutch citizens, four Indians, four people from Slovakia, three Austrians, three Swedes, three Russians, two Moroccans, two Spaniards, two Poles and two Israelis. Boeing said in response to the crash: "Boeing is deeply saddened to learn of the passing of the passengers and crew on Ethiopian Airlines Flight 302, a 737 MAX 8 airplane. We extend our heartfelt sympathies to the families and loved ones of the passengers and crew on board and stand ready to support the Ethiopian Airlines team. A Boeing technical team is prepared to provide technical assistance at the request and under the direction of the U.S. National Transportation Safety Board."